Professional high quality 4 channel DJ mixer. Soundcard to connect to a PC/laptop. 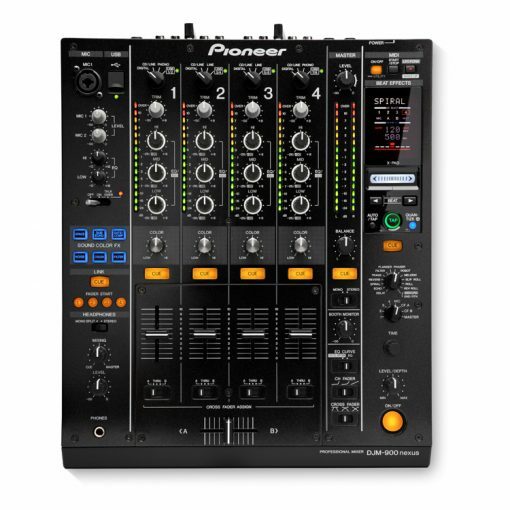 The DJM-900NXS is the industry standard 4 channel DJ mixer, delivering excellent connectivity, up-to-date FX and mind-blowing performance features to make it the centrepiece of any professional DJ setup. 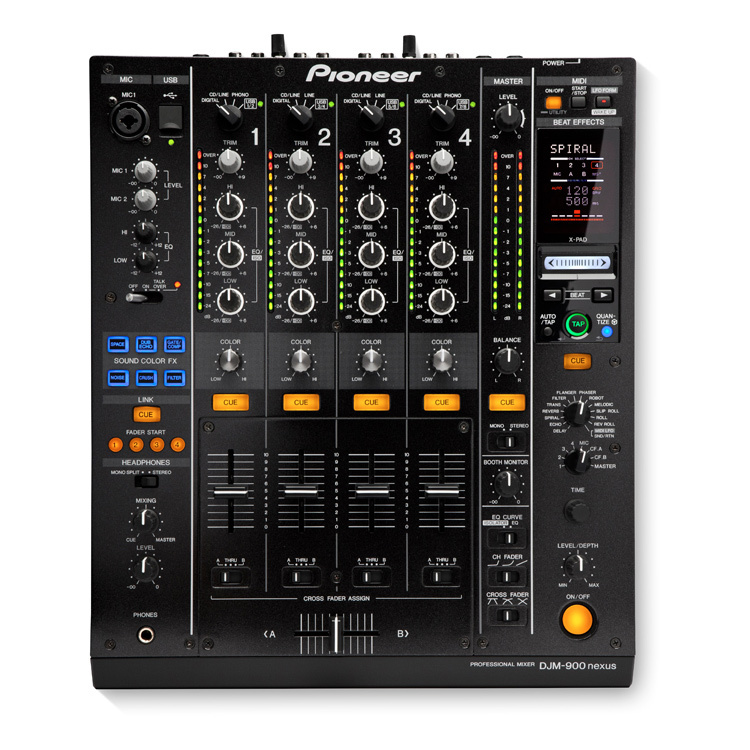 Built to stand up to the rigours of professional use, the mixer features improved fader technology and audio circuits. A built-in USB sound card allows simultaneous input/output of stereo signals from 4 ins and 4 outs, while 96 kHz/24-bit high-sampling processing ensures the highest audio quality. Six studio-quality sound FX – Filter, Crush, Gate/Comp, Dub Echo, Noise and Space – are available on every channel. 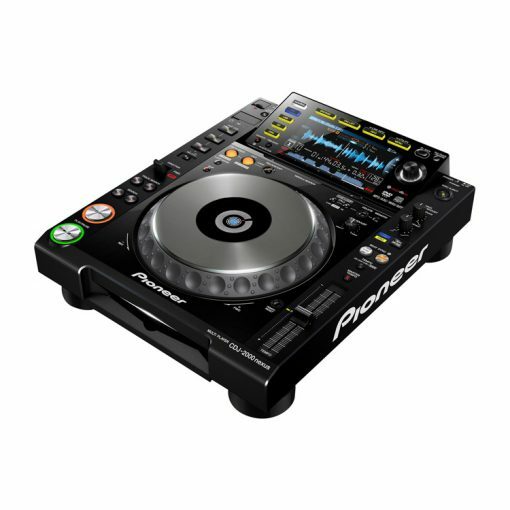 The Pioneer CDJ-2000 nexus is the improved version and successor of the immensely popular CDJ-2000. 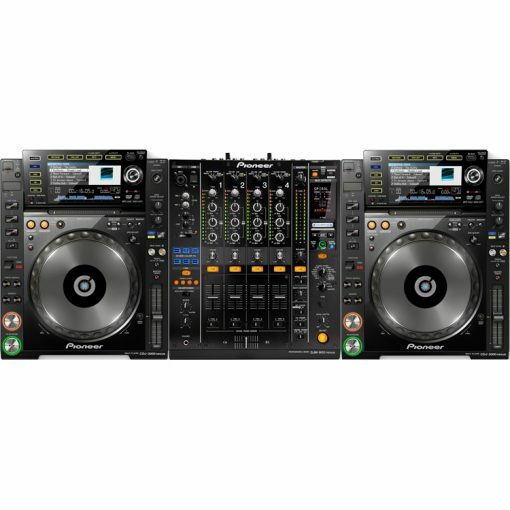 This professional DJ deck has the layout as well as many of the functions of its predecessor, making it feel instantly familiar to those who have worked with the CDJ-2000. With the arrival of Wi-Fi on the CDJ-2000 Nexus, Wireless ProDJ Link has become a reality! It’s no longer necessary to connect your equipment using network cables – from now on you’ll be able to transfer files wirelessly from a single digital source. Additionally, the new Beat Sync function allows for synchronisation of up to four devices with the Master deck, with just the simple press of a button. The CDJ2000NXS DJ deck is equipped with a 6.1-inch full-colour high-resolution LCD display so you can see all of the most relevant information, including mixing tools such as Beat Count and Phase Meter. Above all, the functionality of the browser has been improved, so you can now view tracks as a list or as album artwork. The biggest innovation is the Wave Zoom function with the flood-lit needle strip, which allows you to zoom in on waveforms in order to quickly and precisely edit beat grids and cues, and to search for breaks. Thanks to the integration of Slip Mode, remix functions like looping, scratching and reverse are easier than ever, so you can focus on the creative aspects while the music continues to play in the background. The Quantize function has also been improved to allow you to trigger hot cues and hot loops in sync with the music.